Jesus Flores, who had a solid outing today 1-4 with two runners caught, lead off with a single to right, followed by Bobby Parnell losing control of a pitch to Rick Ankiel and plunking him aboard. Two on, no one out, and at the plate, the leadoff hitter, in the imposing personage of…Brian Bixler? Bixler is the Nats 27th center fielder since 2005, and nominally a utility infielder, but today found himself in the leadoff position, where he went 0-5 with two fielder’s choice. His fielder’s choice in the 9th was an oddly placed bunt that saw Mets’ first baseman Dan Murphy charging in and making a perfect blind throw to third to catch Flores by half a step. One down, but with two on, Ian Desmond fought with Parnell, pushing the count full, before chopping the ball just high enough over the mound to buy time for Ankiel to come around and score the winning run. While the Nats picked up their 51st win, it was a shame to see Zimmermann pitch 6 innings of scoreless ball, scattering seven hits and striking out six, and not also pickup the win. Zimmermann only struggled once, briefly, in the sixth, when he gave up two singles to Dan Murphy and David Wright, and in his distraction, balked them over to 2nd and 3rd. Zimmermann regained his focus, and slammed the door shut on the Mets, striking out both Angel Pagan and Jason Bay on ten pitches. 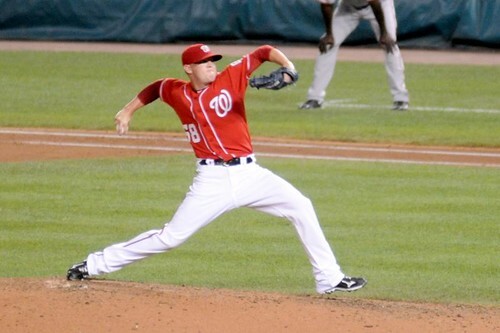 Zimmermann, recovering from Tommy John surgery performed in 2009, is innings-limited, and after the game Manager Davey Johnson said that he likely had just four starts remaining in 2011. He indicated that he felt that Zimmermann was in the best shape of anyone on his staff, and were this a different season, he might be pushing for Jordan to stay with the team the rest of the season. Johnson also suggested that further changes to the 25-man roster would be coming, both to rebalance the bullpen (don’t get too attached to Atahualpa Severino) and to make changes to the utility situation with Hairston gone. I’d expect to see a flurry of moves over the next few days before the Nats head for Colorado. The Braves arrive tomorrow, with newly-minted leadoff hitter Michael Bourn in tow, to face Livan Hernandez, John Lannan and Chien Ming Wang in a three game series to close the home stand. The Nationals are 2-4 on the home stand so far, and would need to sweep the Braves to make this a winning home swing. They finish July 11-15, and 51-56 overall. That’s significantly better than anyone had predicted going into the season.